2001-08-03. New. Ships with Tracking Number! INTERNATIONAL WORLDWIDE Shipping available. Buy with confidence, excellent customer service! 2009-09-24. New. Ships with Tracking Number! INTERNATIONAL WORLDWIDE Shipping available. Buy with confidence, excellent customer service! Harpercollins, 1966-06-01. Enlarged. Hardcover. Used:Good. Andre Deutsch Ltd, 1968. This is an ex-library book and may have the usual library/used-book markings inside.This book has hardback covers. In poor condition, suitable as a reading copy. New York: Harper & Row, 1966. Fine/Near Fine. Reprint. Octavo. A little sunning along the top of the boards else near fine in slightly spine-sunned near fine dustwrapper. 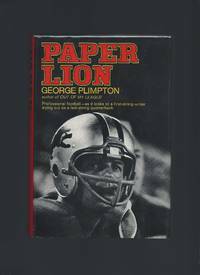 Signed by Plimpton on the front free endpaper. 2003-10-01. New. Ships with Tracking Number! INTERNATIONAL WORLDWIDE Shipping available. Buy with confidence, excellent customer service! 2016-04-26. New. Ships with Tracking Number! INTERNATIONAL WORLDWIDE Shipping available. Buy with confidence, excellent customer service! Signet Books. Used - Good. Good condition. 1974-08-01. Good. Ships with Tracking Number! INTERNATIONAL WORLDWIDE Shipping available. May not contain Access Codes or Supplements. May be ex-library. Shipping & Handling by region. Buy with confidence, excellent customer service! 1977-09-20. Good. Ships with Tracking Number! INTERNATIONAL WORLDWIDE Shipping available. May not contain Access Codes or Supplements. May be ex-library. Shipping & Handling by region. Buy with confidence, excellent customer service! 1974-08-06. Good. Ships with Tracking Number! INTERNATIONAL WORLDWIDE Shipping available. May not contain Access Codes or Supplements. May be ex-library. Shipping & Handling by region. Buy with confidence, excellent customer service! Holtzman Pr, 1981-06. Hardcover. Good. 1988-05-08. Good. Ships with Tracking Number! INTERNATIONAL WORLDWIDE Shipping available. May not contain Access Codes or Supplements. May be ex-library. Shipping & Handling by region. Buy with confidence, excellent customer service! 2009-09-24. Good. Ships with Tracking Number! INTERNATIONAL WORLDWIDE Shipping available. May not contain Access Codes or Supplements. May be ex-library. Shipping & Handling by region. Buy with confidence, excellent customer service! 2001-08-03. Good. Ships with Tracking Number! INTERNATIONAL WORLDWIDE Shipping available. May not contain Access Codes or Supplements. May be ex-library. Shipping & Handling by region. Buy with confidence, excellent customer service! 2016-04-26. Good. Ships with Tracking Number! INTERNATIONAL WORLDWIDE Shipping available. May not contain Access Codes or Supplements. May be ex-library. Shipping & Handling by region. Buy with confidence, excellent customer service! Lyons Press, 2006-09-01. 1. Paperback. Used:Good. The Lyons Press. PAPERBACK. 1592280153 New Condition. . New. Lyons Press. PAPERBACK. 1599210053 New Condition. . New. Harper & Row. Hardcover. 0060133619 New Condition. . New. Lyons Press. PAPERBACK. 1599218097 New Condition. . New. Harper & Row, 1966. Possible first with AA-R on CL. Blue boards have silver helmet inprint. Some fading to boards. Red topstained. Interior is clean and tight. DJ has light edgewear. Price intact (5.95), 1066 code to bottom. Protected in mylar. Nice copy. Hard Cover. Very Good/Near Fine. 8vo. Lyons Press, 2006-09-01. 1. Used - Like New. Used Like New, no missing pages, no damage to binding, may have a remainder mark. New York, New York: Harper & Row, 1966. First Edition First Printing . Hardcover. Very Good/Good. Combining humor, inside sports-lore, mayhem, & excitement...in the adventures of a professional writer & weekend athlete as quarterback with the Detroit Lions.'' In 362 pages with 16 pages of real photos in center. A FIRST EDITION, First Printing with appropriate statement, this hardcover book is in VG condition: generally very clean with light surface soiling to outside page edges. Binding is strong & straight. NO writing, underlining, or highlighting. NOT ugly ex-lib. Unclipped DJ (with original $5.95 price at top & 1066 code at bottom of front flap) is downgraded to only Good to to a 2" unclosed tear ascending from middle of bottom edge of front cover & small nicks & chips & edgewear all around. Looks lovely protected in new archival mylar cover Free! . Please see our 5 photos--they show the EXACT book you will receive from us--NOT "stock" images! Description & photos copyright Gargoyle Books 2017. Same Day Shipping on all orders received by 2 pm Weekdays (Pacific time); Weekends & holidays ship very next business day. LITTLE BROWN. New. 8.46 x 5.89 cm. Harper & Row. Hardcover. 0060133619 1966 Harper & Row hard cover - stated First Edition - 1st printing - not price clipped - not book club - 3/4 inch tear to bottom front edge of dust jacket (now in mylar cover) stain on top page edge - minor foxing on end papers - some sun fade to edge of cover - otherwise binding strong contents clean - enjoy . Good. New York: Harper & Row. 1966. First Edition; Early Printing. Hardcover. Very Good+ in a Very Good+ price clipped dust jacket. Small owner bookplate at top of FEP. Light bumping at spine crown and top corner of front panel. .
NY: GEORGE H. DORAN, 1914. signed by matthew b. dubois. ( nyc doctor 1841-1918). descendant of jacques du bois.. 1ST. HARDCOVER. VG. The Lyons Press, 2003-10-01. 1st. Paperback. Used:Good. 2003-10-01. Good. Ships with Tracking Number! INTERNATIONAL WORLDWIDE Shipping available. May not contain Access Codes or Supplements. May be ex-library. Shipping & Handling by region. Buy with confidence, excellent customer service! New York: Harper & Row. 1966. First Edition; First Printing. Hardcover. Book condition is Very Good in boards, with a Very Good+ dust jacket. Minor edge wear to jacket, including a short tear. Weak fading to edges of boards. Two spots of toning to page edges. Text is clean and unmarked, photographic illustrations. First Edition is stated. ; 8vo 8" - 9" tall . New York, et al: Harper and Row. Very Good in Very Good- dust jacket. 1966. Hardcover. Some wear DJ extremities. ; INSCRIBED and dated 7 November 1966 by the author on the front endpaper. .
N Y: HARPER & ROW, 1/1/1965 1966. hard cover no dj. good for its age no d/j. New York: New American Library. Very Good. 1974. Fourth Printing. Softcover. Inside of covers are black and white photographs. "A continuous feast...you wish it were six times longer....The best book ever about football - or about anything! "- The Wall Street Journal. Ships same or next business day. Normal shelf and edge wear, spine has one crease, pages are clean tight and with a slight bit of tanning. ; Signet W 6029; 12mo 7" - 7½" tall; 326 pages . The Lyons Press. PAPERBACK. 1592280153 Like New Condition. . Fine. Harper & Row. Hardcover. 0060133619 Like New Condition. . Fine. Lyons Press. PAPERBACK. 1599218097 Like New Condition. . Fine. Lyons Press. PAPERBACK. 1599210053 Like New Condition. . Fine. Signet. MASS MARKET PAPERBACK. 0451076680 Condition: GOOD. (Book may have one or a combination of the following characteristics: former library book, dust jacket missing, cover wear, name written inside cover, considerable underlining/highlighting, remainder mark, binding loose, binding slants, pages tanning / curling, etc. Overall, the book is in decent shape. This is a blanket description. Please email us if you require a specific, detailed description of the book condition. We will typically respond within 24 hours). . Good. Harper & Row. Used - Good. Shows some signs of wear, and may have some markings on the inside. The Lyons Press. Used - Like New. Book in almost Brand New condition. Signet, September 1977. Paperback. Good - Cash. General use wear, surface and edges rubbed with some creasing. Corners bumped and show wear. Pages show reader wear. Unmarked pages. Previous owner's Stock photos may not look exactly like the book. Signet , August 1974. Mass Market Paperback. Used - Very Good. Slight bump to bottom of spine, minor scuffing to bottom right corner of front cover, covers otherwise clean and square, book block yellowed, pages otherwise clean and square, binding tight with now spine creases; appears unread. New York: Harper & Row, 1966. First Edition, First printing. Hard Cover. Stated First Edition. SLIGHT SUNNING TO BOARDS, OTHERWISE A FINE, CLEAN, TIGHT COPY IN A FINE, PRICE-CLIPPED DUST JACKET. New York: Harper & Row, 1966. Book. Fine. Hardcover. First Edition. Early printing from April 1967, six months after the first printing. A clean and bright fine copy in a fine first state dust jacket with the price of $5.95 and date code of 1066 intact on the front flap. Basis for the 1968 film directed by Alex March and starring Alan Alda, Lauren Hutton and Joe Schmidt. An attractive and collectible copy..